David Bowie is a brilliant legendary English musician, actor and record producer, known for his unique innovative music style and intellectual depth including the album, The Rise and Fall of Ziggy Stardust and the Spiders from Mars. David Bowie has a single tattoo design on his left calf, which contains several sub designs. 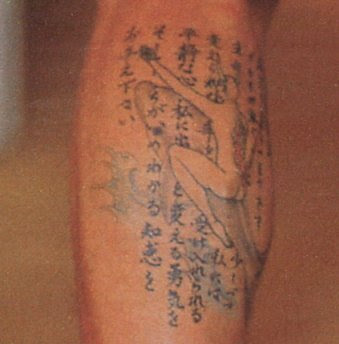 The tattoo is of a man riding a dolphin with his left hand extended, holding a little frog, plus the the background is a Japanese variation of the Serenity prayer, translated into Katakana. Regarding his tattoo, David Bowie has been quoted "as a confirmation of the love I feel for my wife and my knowledge of the power of life itself."